Following a disastrous third quarter in 2011, the automotive sector staged a modest comeback in the final three months of last year. The best performance in the latest Automotive News Europe/PricewaterhouseCoopers Transaction Services Shareholder Value Index came from suppliers. Partsmakers went from a Q3 decline of 34 percent to a 5.7 percent Q4 gain. It was a similar story for automakers, for whom a 33 percent Q3 fall was followed by a 3.7 percent Q4 gain. However, while retailers also enjoyed an improvement over the same period, they remained in negative territory. Here the Q3 decline of 2 percent was followed by a 1.5 percent fall in Q4. Unlike automakers, which had two positive quarters in 2011 and suppliers, which had three, retailers' shareholder value fell in every quarter last year. 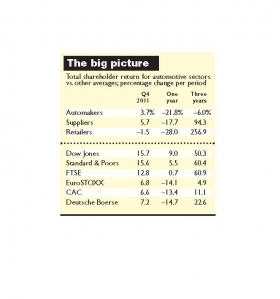 Overall, Europe's automotive sector once again lagged stock markets, where Q4 gains were delivered across the board. This included gains of 16 percent in the Dow Jones Industrial, 12 percent on the FTSE 100, 7 percent on Germany's DAX 30 and 7 percent on the French CAC 40. Amongst automakers, Porsche Automobil Holding SE achieved sector-leading shareholder value growth of 14.7 percent in the latest Automotive News Europe/PricewaterhouseCoopers Transaction Services Shareholder Value Index. The German sports car maker confirmed in October that it was set to hit its target for 2011 of more than 100,000 unit sales, buoyed by rapidly growing demand in China, up 82 percent in the first nine months, and the strength of its popular Cayenne SUV. Profits in the first nine months were up 25 percent. This recovery followed the setback in its fortunes when it announced last September that its efforts to combine with Volkswagebn Group had been delayed by U.S. lawsuits stemming from Porsche's failed attempt to takeover VW in 2009. Meanwhile, VW slipped to second place in the Q4 shareholder value index with 11.2 percent growth. That reflected a 14 percent increase in companywide global sales last year to more than 8 million vehicles, with new versions of the Passat and Audi A6 helping to lift demand. The next best performer in the quarter was Renault, up 6.9 percent. BMW and Daimler also returned to positive growth, up 3.6 percent and 0.9 percent respectively. The two worst performers in Q3, however, Fiat and Peugeot, remained in negative territory. The Italian automaker's shareholder value fell by 13.3 percent in Q4 after a 46 percent decline in the preceding quarter. For Peugeot the position was worse, with a Q4 decline of 25.1 percent coming on top of a 48 percent fall in Q3. With sales contracting in four of Europe's five largest markets, the outlook for the two French manufacturers in particular is widely seen as being particularly difficult. "The OEMs who are most exposed to the European markets are struggling and these conditions are not likely to ease this year," said Jason Wakelam, leader of PwC UK's Automotive Transaction Services. "The key question for 2012 is to what extent the calls for consolidation in the sector will be realized." 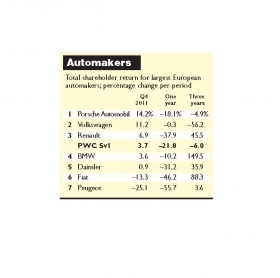 Exactly half of the suppliers in the Automotive News Europe/PricewaterhouseCoopers Transaction Services Shareholder Value Index recorded growth in shareholder value in Q4. The overall performance of the sector, however, was exceptionally mixed. At the top of the table, Miba AG, the Austrian-based producer of sintered components, engine bearings and friction materials, achieved a 19.3 percent gain in its value to shareholders. This improvement reflected continued increases in sales resulting from a combination of organic growth and acquisitions. Sales in the firtst nine months equaled those achieved in the whole of the preceding 12 months. For the full year, the company reported that net profits rose more than threefold compared with 2010. Safety systems maker Autoliv took second place in Q4, with a 15 percent gain, while Germany's Continental AG improved by 10.2 percent. Autoliv, the global leader in passive safety systems, also has a strong focus on active safety systems, which is a big growth segment of the market. As a result, for eight consecutive quarters it has achieved organic revenue growth ahead of the market as a whole. This has also enabled it to achieve earnings at least in line with, and often ahead of, investor expectations. Half of the partsmakers included in the shareholder value index did not return to growth in Q4. The worst performer was Norwegian driver controls and cable specialist Kongsberg. It is the only partsmaker to have recorded a decline in every quarter in 2011. It capped a 44 percent decline in shareholder value in Q3 with a further 40.2 percent decline in Q4. Delays in some cost reduction initiatives and a negative product mix were cited by the company as the main reasons or forecasting a reduction in 2011 profits when reporting results at the end of Q3. The next biggest loser in the quarter was Plastic Omnium, down 14.9 percent. But the French front-end maker experienced mixed fortunes during the year, enjoying good growth in the first two quarters and losses at the modest end of the scale compared to others in Q3. The company actually achieved a 40 percent increase in the third quarter of this year and reaffirmed its forecast for a sharp increase in earnings for the year as a whole. 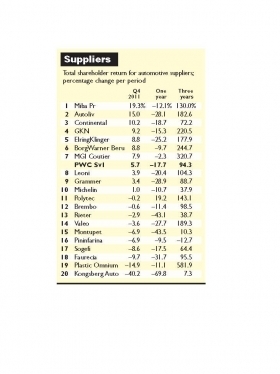 "Suppliers had varying levels of success in Q4. As ever, those who can align themselves with the growing OEMs or carve out a successful niche in a growth area will be the most successful," said Jason Wakelam, leader of PwC UK's Automotive Transaction Services. 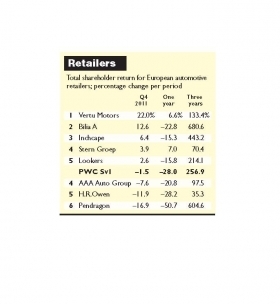 Most auto retailers enjoyed an improved fourth quarter, as reflected in the Automotive News Europe/PricewaterhouseCoopers Transaction Services Shareholder Value Index. Five of the eight companies that comprise the index returned to growth with the UK's ninth-largest dealer group, Vertu, improving by 22 percent on the back of an aggressive growth strategy. It was followed by Sweden's largest dealer group, Bilia AB. The company reported strong third-quarter growth in both sales and earnings, although it did caution that demand for new cars is expected to decline slightly in Sweden and Denmark in Q4, while remaining unchanged in Norway. Global retailer and distributor Inchcape delivered fourth-quarter growth of 6.4 percent, while the Netherlands' largest car dealer, Stern Groep, managed a more modest 3.9 percent gain in its value to shareholders. AAA Auto Group remained second from bottom for the third quarter running, with a 7.6 percent fall following a 25 percent drop in Q3. HR Owen, the UK luxury car specialist, relinquished 11.9 percent of its shareholder value while Pendragon, which operates 300 franchises across the UK, again took last place, this time with a 16.9 percent decline. "While retailers did not see the kind of declines in value seen in Q3, the market continues to look difficult for them given the lack of consumer confidence in the larger European markets," said Jason Wakelam, leader of PwC UK's Automotive Transaction Services.